Have you become a fan of Five City Spa? Then the Frequent Fiver Card suits your needs. You pay for 5 massages or facial treatments and receive the 6th from us! 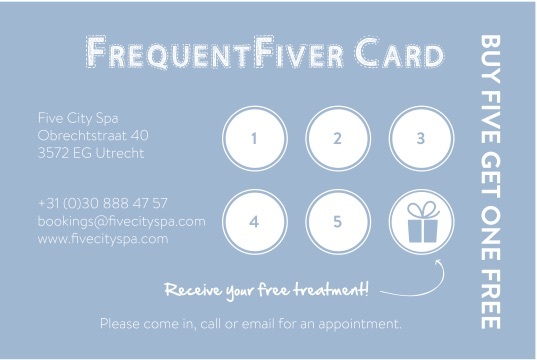 You can purchase The Frequent Fiver Card in the spa or online. The Frequent Fiver Card is a great gift for someone who really needs some relaxation time. Purchasing the card can be done at any time and the price is 5x your chosen massage or facial treatment. Perhaps you have just had a massage then at check out you can purchase the card and this massage can count as your first visit. You can also use the card with two persons, for example for a Duo Massage. You choose in advance the length of all 6 massages. It’s possible to pay extra when you want a longer massage than on the card, unfortunately we cannot give money back when you choose a shorter massage than on the card. The card is valid for an unlimited time until it’s full. If prices go up you might have to pay the difference. Frequent Fiver Cards can only be used at the location of the original purchase.